Collaborative robot (cobot). Optional safety system. 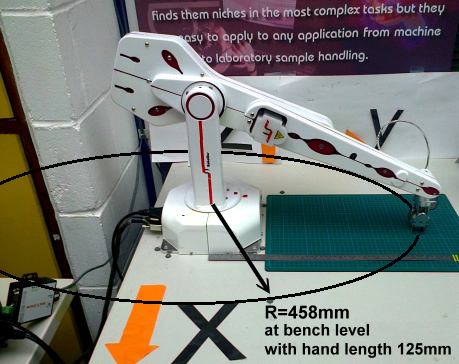 The R12 is a complete self-contained five or six axis vertically articulated robot arm system designed as a cost effective solution for bench top automation. Applications include testing, sample handling, machine feeding. 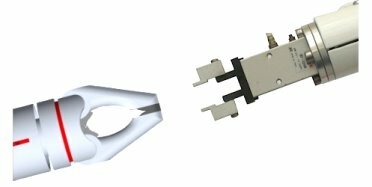 The hand terminates in a mounting plate to which can be mounted one of our low cost grippers, vacuum pickups or your own device. R12 is a very low cost entry to real industrial robotics, fast, accurate and reliable and easy to program yet capable of the most complex tasks. It has a useful 500mm reach and a 500g payload. Designed by a young engineer building on our existing R17 technology it is a breakthrough in bench top robotics. It is lighter, faster and quieter than R17, using high efficiency digital motors driving through steel reinforced polyurethane timing belts. Optional incremental optical encoders provide exceptional integrity as well as safety (see below). Note that R12 is not a hobby robot. It is a professional tool made to industrial standards, machined from solid alloy and finished with aesthetic acrylic covers. The system is supplied complete with controller, all cables, connectors, software, comprehensive manuals, ready to unpack and use immediately. Max torque for pitch or roll: 1 Nm (repeatability figures degrade with increasing load). Optional LED awareness barrier, optional workspace sentry system. Max torque, pitch or yaw: 1 Nm (repeatability figures degrade with increasing load). As standard the robot terminates in a mounting flange (see diagrams below). 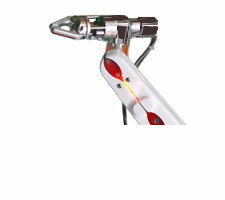 End effectors currently include: electric gripper, SMC 10mm pneumatic gripper, vacuum pickups. 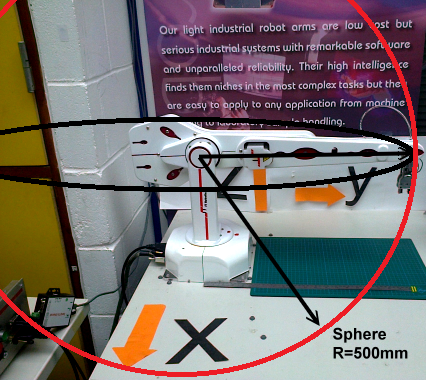 This is a simple solution that makes the 6th axis entirely optional as opposed to being an integral part of the design. Using a small motor and gearbox it is accurate and tough. Programming is an extension to the Cartesian functions of RoboForth. In this way the system can ensure the end effector points in the same direction (same orientation to X Y Z axes) as the robot moves around, or indeed in any direction you choose. up to 3m length, using a powerful motor and dual recirculating crossed roller bearings. to permit collaborative robotics in safety, meeting ISO15066. comprising 2 R12 robots on a programmable carousel. 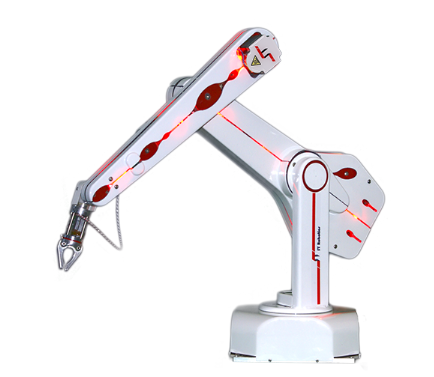 Two robot controllers are interlinked to synchronize the two robots. Optional glove for hazardous environments. Control a robot arm on webcam from anywhere in the world.